I am writing to you from Austin, Texas! I arrived safelt yesterday and have enjoyed and good nights rest to begin my first day in the "Lone Star State". When I landed in San Antonio, there was some initial problems with my bag. They did not have my bag when I got off the plane and they were not sure where it was. I had to full out a luggage tag and everything...luckily, after 10-15 minutes it arrived and I had clothes to wear. Since we were in San Antonio, I figured we could do some of the San Antonio stuff. I had the opportunity to walk on the Riverwalk and also got a picture of the Alamo. I will post some of these pictures later in the week when I get back or have access to a Windows friendly computer (I am using a MAC right now). 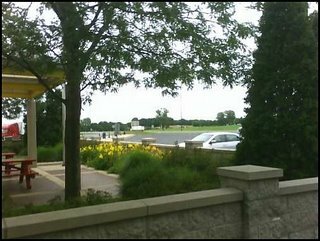 Airports provide great opportunities for people watching; I was amazed as to what I saw in the Chicago O'Hare airport. I started a new book called "White Guilt" by Shelby Steele, I happened to be sitting next to a black woman while I was reading the book. I actually wondered how she would feel if she happened to see what the book was about. I actually hid the cover to avoid a conversation/confrontation. How sad for me that I didn't feel comfortable. Our flight from Milwaukee to Chicago was 17 minutes...seventeen minutes. I have never been on a flight so short. For your viewing pleasure, this was the view from the Ohio I-90 rest stop as I waited for Chris to pick me up when the tow truck dropped me off. Well, after many phone calls and much frustration, my car is finally fixed. When I chatted with Kyle from the Westville Hwy 6 Auto Shop, the total cost for fixing my vehicle will be $908.00. This will not include the gas and tolls it will take to go down and get the vehicle. Originally, I was under the impression that the catalytic convertor would just need to be replaced. It turns out that after further inspection, the entire exhaust system needed to be replaced. I was very frustrated the entire week because I felt like I was really left in the dark about what was wrong with my car and how much it cost. I had to contact them over and over to get any idea what was going on with my car. Needless to say, I expressed to the owner of the shop my frustrations about their poor communication. It turns out that the owner was gone for the week and the person left in charge was not necessarily all that experienced. After expressing my concerns, I sensed that what was fix ed needed fixing. I will be picking up my car a week from today. Good times! In better news, I received a call from the District Superintendent for our church. Despite the constant calling from various members of the congregation asking me to move faster on our church concerns, I am holding fast to our process. Jorge, the DS, said that I should keep going with how I am going and make sure that I do not let others sway me from the process. So, only time will tell how all of this church business goes down. It has been tough so far. 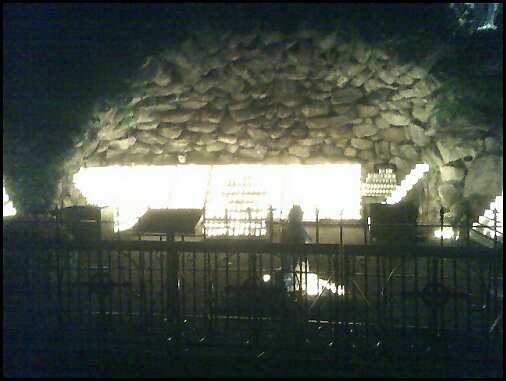 The picture here is of a grotto with candles where folks at Notre Dame can light candles and say prayers. It is a beautiful sight. 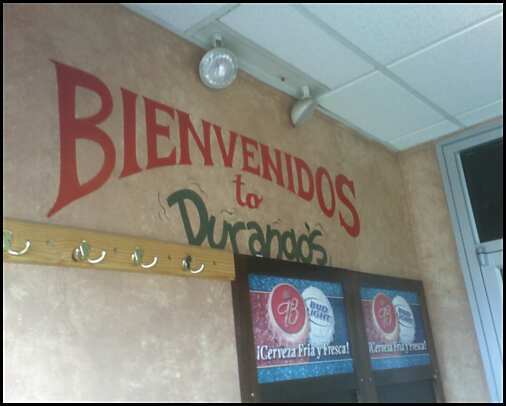 While visiting Chris Sewalish at Notre Dame, during the course of our conversations Chris brought up how much he likes the sign that greets customers when they come into a restaurant named "Durangos". Don't ask me how we got started with that...he liked the wonderful fusion of English and Spanish with "Bienvenudos to Durangos". I sent him this photo, but I also thought I'd post it here as well...it's pretty nice. With the posting of this picture I can announce that I have now joined the picture/text messaging generation with my cell phone. I am now able to take pictures with my cell phone and picture message them to a website where I can do with them what I want. You can look forward to more random pictures of stuff going on around campus, Oshkosh and beyond...perhaps even my trip to Texas. Woot! Going through training for the fourth time! Regardless, I look forward to my trip to Texas starting on Sunday and I look forward to seeing Dario while I'm out there! Well, I didn't get to last night's game until the 5th inning. I worked at the front desk for EAA until 9:00 pm; the game started on time at 8:30. When I got there we were down by seven runs. I took over for Tex whose knee was acting up. I didn't get a chance to bat because the mercy rule was invoked. It was nice to at least get there and be a part of the game. Sorry, no updated stats! I won't be at next week's game because I will be in Texas. Still waiting to hear about my car. Hopefully it gets fixed in the next few days...not like I'm in any hurry. Not sure when I'll ne in Indiana again, but it will likely be the first weekend in August. I figured that when the summer started I would lose the routines that I usually get pretty good at during the year. This summer has had a few bumps but I have managed to keep up many of the positive routines that I got into. As you have read earlier, my weight has gone down and I am "feeling" healthier. With the new cell phone I am able to keep in better contact with folks. I feel more connected to friends. Overall, things are really good. Unfortunately there is a lot of upheaval in our church and this is making things difficult. Well, I will be leaving South Bend in less than an hour. Chris will be driving me back to Milwaukee. During my stay, I had the opportunity to check out the College Football Hall of Fame. That was really cool. Chris also took me on multiple tours of the Notre Dame campus, both at night and during the day. I got to eat at Notre Dame's food service and it is incredible. The pretty much had anything you'd want available to eat. As I said before, Chris and I had many opportunities to chat and catch up, it was great. I am thankful now for having both a cell phone and AAA. Without those I might have been sitting at the roadside of Highway 90 in Indiana for a long time. I think that is all for now. This is the first weekend in awhile I am actually blogging on the weekend. Well, usually I would start a post like this by saying, "I got to [insert location] safely". Unfortunately, I can not say that this time. About twenty miles outside of South Bend, my car started to decelerate to 60 miles an hour no matter what I did. After pulling over and restarting my car, if I ever tried to accelerate it made an eery sound in the rear left tire. I called AAA and after holding for 30 or so minutes, they said someone would come to tow my car. After waiting 30 minutes for the tow truck to come, Jason (the very nice tow truck driver) dropped me off at the nearest toll way oasis where Chris picked me up. They are going to need to replace my catalytic convertor which should be around $200. Including labor, I can only imagine how much that will be. The key is that it won't be fixed until at least Monday and I have to be back in Oshkosh for work at 6pm. So...I am having Chris drive me to Milwaukee tomorrow so that Christa can take be back to Oshkosh. It will probably be 1-2 weeks before I will have the time to go back to Indiana to pick up my car. It has been great to see Chris and catch up, but this whole situation has made the weekend difficult. In a few hours I will be making my way to South Bend to visit Chris Sewalish at the University of Notre Dame. I feel like I am leaving Oshkosh with things in good hands. I have attempted to move FUMC Oshkosh forward in what have been some difficult times...although I know there are folks that say we are not moving fast enough. My apartment is cleaned up and I am almost completely caught up on personal and business paperwork. I am not sure what kind of internet access I will have, so I will try to post this weekend while I am at Notre Dame. Peace. Well, as of this morning I was 197 pounds. I have this interesting program that tracks your weight each day and also tracks your "trend weight" averaging over time to show trends. Since May, I my trend weight was gone from 202 to 197. It has been slow progress, but it has been progress. The change in diet and exercise has made a big difference. My goals was to get my "trend weight" down to 190 and I think if I keep things up it should be possible. Well, it's been a few weeks since I've played in our team's softball game. Last week I had the youth trip, week before that was July 4th and the week before that I had the Church Council meeting. It was nice to be back playing softball. I will also be able to play next week as well. Last night's game ended up being 24-12 and we were able to play six innings of softaball and we got to play the entire 60 minutes we were alloted. This weekend I will be visiting Chris Sewalish at Notre Dame. I told him in the spring that I would visit him and I was not very good at ironing out an exact date. Now it is done. It will be nice to ctach up with him; it will also be cool to see the Notre Dame campus. I hear it is beautiful. I am not sure about the church layout or availability, but it would be really cool to attend a Sunday mass at a cathedral on campus. At the end of July and into early August I will be flying out to Austin, Texas to visit my friend Dario Landazuri. The last time I saw Dario was when he came to visit me while I was in graduate school. It has been about 4 years. It's about time I visit him. He said that I should be ready for some BBQ...most exciting! In between these trips, I will be working the Breese Hall Front Desk for the Experimental Aircraft Association (EAA) Fly-In. Again, the commute shouldn't be too rough. ;) I enjoy working for EAA because it gives me the opoportunity to catch up on filing and other paperwork stuff. ..woot! I actually have a phone that carries a signal in my entire apartment. I don't have to go outside to make a phone call. Yay! Expect some phone calls from me in the near future...or call me! Last night when I got back from seeing Pirates of the Caribbean 2 (more in a later entry), I got a message from Christa saying that she came back from a long bike ride....40 miles. Forty miles! That's incredible. I was a little unsettled because she rode back at night, without a light on the Wiouwash Trail. I was worried for her, but honestly biking 40 miles is quite impressive. She almost biked to Appleton and back. For someone who only recently bought her bike and only recently started to exercise on a consistent basis, I am very proud of her. Our sleeping conditions were interesting. We slept on the floor of the church, as the pews that were down there did not provide much comfort. The first night we discovered some extra visitors, cockroaches. Luckily, if they came by me while I was sleeping, I did not see them...I will consider myself lucky. It made me realize how truly blessed I am for where I live and what I have. I got to see a great deal of Chicago that I did not see before. The pastor from the Waukau church did his seminary work in Chicago and he took us all over the city. It made for a lot of driving, but I did appreciate the tour. Cara and I had the opportunity to talk a lot about some of the problems that our church is facing. I think we have been able to develop some strategies for how to deal with them. I am actually looking forward to making some progress in this area. It felt good to do some volunteer work, especially out of the Oshkosh community. I felt like the painting and cleaning that we did really made a difference for the members of the church. We also donated a new vacuum to them because they did not have one that worked. If you have any questions or thoughts, let me know. Thanks! I have a lot of work to do...this summarizes it all :). We do not allow people to drink and drive. However, we do allow people to drink and boat. Is not this still a hazard? I can't be the only that feels this way. It is interesting to reflect back on high school and realize how much emphasis is placed on status, especially based on your grade level (sophomore, junior, etc.). As a sophomore, when I had the chance to date a junior I felt like I had been lifted completely out of my social standing in high schoo. It is just not the came in a college environment. Well, the dust has settled on what has been a slightly crazy last two week. Although it is the summer, I feel as though I am still working as hard as I do during the regular school year. Today, Christa and I will be traveling to Oconomowoc to spend July 4th with the Macintosh clan. The house we are going to is right on a lake, so there is plenty opportunity for swimming, tubing and eating :). This will be the first time I have seen the family post-engagement.